You’ve gone to great lengths to take care of your home, including putting on a new roof, updating the siding, and making sure there’s plenty of insulation. What about the plumbing? If you live in an older home in the Bay Area, there could be hidden plumbing issues that you’re not aware of until something breaks or causes a massive flood in your house. At Gladiator Repipe, we want to help homeowners avoid those catastrophes, and with our plumbing and repipe services, you can rest easy that your pipes are in good shape. If you live in Brisbane, give us a call today! There are situations where old galvanized pipes have simply reached the end of their lifespan, and are no longer useful. When that happens, you need an alternative solution. 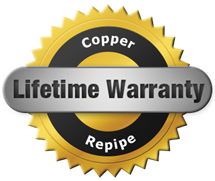 With our repipe services, you can have copper or PEX plumbing installed that will last for decades. No more worrying about poor water pressure or a lack of hot water throughout your house. On top of repipes, we can also provide water heater repair and replacement. If it turns out the problem isn’t with your plumbing but with your water heater, we can replace broken or worn out parts, or replace the entire appliance altogether. If that’s the case, we’ll help you choose a new, energy-efficient model that fits your budget. We also offer other exceptional plumbing services, including drain cleaning and sewer repair. If something is clogging your drains, or you’ve noticed a problem with your sewer, we can be there to take care of the problem. We’re proud to serve the citizens of Brisbane, and when you’re searching for plumbing companies in the area, make your first and only call to Gladiator!